A daring new documentary that uses scientific analysis to challenge the official 9/11 story became the most popular film on PBS during the week of the 9/11 anniversary, which followed its record-breaking broadcast on Colorado Public Television (CPT12). The mission statement of Colorado Public Television – Channel 12 (CPT12) states that it is “committed to presenting alternative perspectives and to examining information and issues not addressed elsewhere in the mainstream media.” It fulfilled that mission in spades on August 18 when it broadcast our new documentary 911: Explosive Evidence – Experts Speak Out to thousands of central Colorado TV viewers, and the premiere continued to make an impact, becoming the “most watched” and “most shared” video on PBS nationwide in September. Our intrepid AE911Truth Action Group bicyclists, Rena Patty and Pam Senzee, have completed over 2000 miles of their 4000-mile journey across the country. They reached the halfway point of Fargo, North Dakota, on September 8, fighting 40-mph winds for the last 40 miles. Rena and Pam are equipped to camp out in tents but occasionally are offered accommodations under a warm roof. Editor’s Note: The following article was written by former Assistant Treasury Secretary and Wall Street Journal editor Paul Craig Roberts for the Journal of 9/11 Studies. We applaud him for calling attention to the vital work of AE911Truth and the scientists who have brought the explosive 9/11 evidence to light. In order to understand the improbability of the government’s explanation of 9/11, it is not necessary to know anything about what force or forces brought down the three World Trade Center buildings, what hit the Pentagon or caused the explosion, the flying skills or lack thereof of the alleged hijackers, whether the airliner crashed in Pennsylvania or was shot down, whether cell phone calls made at the altitudes could be received, or any other debated aspect of the controversy. Editor’s note: This is Part 6 (see Part 5) of an extensive report by 9/11 researcher Adam Taylor that exposes the fallacies and flaws in the arguments made by the editors of Popular Mechanics (PM) in the latest edition of Debunking 9/11 Myths. We encourage you to submit your own reviews of the book at Amazon.com and other places where it is sold. The final section of PM’s chapter on the Twin Towers addresses a theory that is not widely believed among members of the 9/11 Truth movement: that large seismic spikes indicative of explosions occurred before the Towers collapsed. 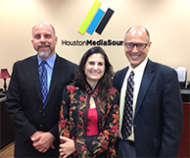 Following the 32-city world premiere tour of 9/11: Explosive Evidence – Experts Speak Out, AE911Truth took yet another whirlwind trip through Texas from July 14-16, showing the compelling documentary in Houston, San Antonio, and Dallas. Media outlets from across the state and local activists joined Richard Gage, AIA, and other respected architects to screen the film and discuss the push for a new 9/11 investigation. Here is a recap of those influential events. 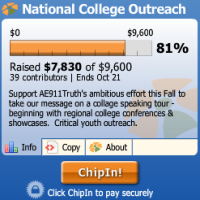 Support AE911Truth’s ambitious effort this Fall to take our message on a college speaking tour – beginning with regional college conferences & showcases. Outreach to the colleges is our critical mission for the 2012-2013 school-year. Support AE911Truth team leaders Pam Senzee & Rena Patty who have embarked on a 3,000 mile bike journey across the country – passing out DVDs and talking to everyone along the way. Copyright © 2012 AE911Truth All rights reserved.